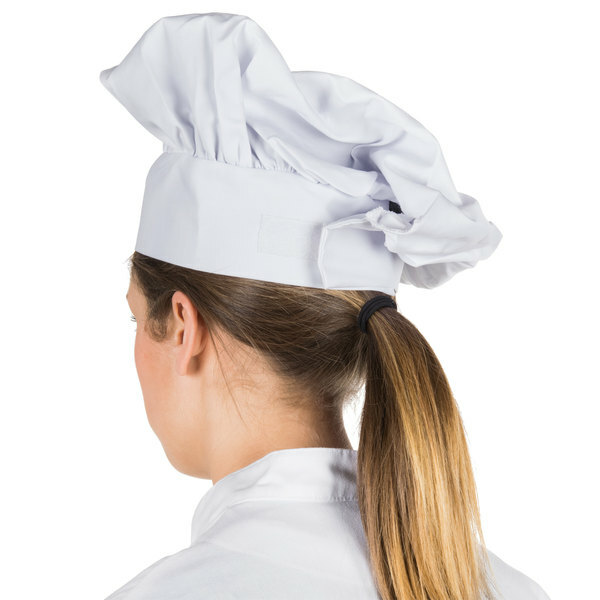 Give your kitchen staff a bit of professional flair with this classic white chef hat! This chef hat is made out of durable, lightweight cotton and washes well. Featuring an adjustable Velcro® closure, this hat will fit a variety of sizes and at 13" tall, it even adds height to the wearer. Light enough to not be heavy on your head, but heavy enough to keep some shape. Great hat that fits well. 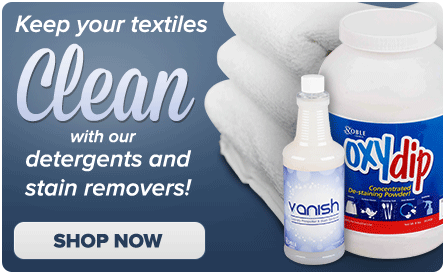 Material is easy to clean and holds up to continuous cleanings. 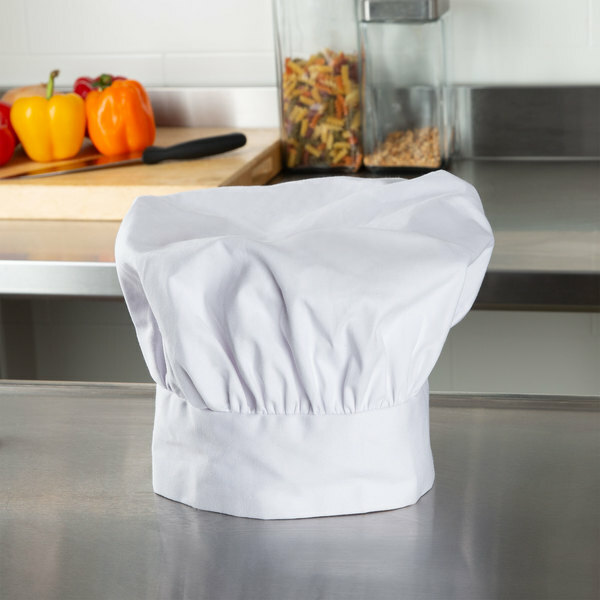 We like this Chef Hat, as a former restaurant manager I am constantly harping on kitchen cleanliness and how easy it is to cross contaminate or contaminate food period. Having Chef hats and other kitchen hats have been a fun way to drive home the idea with lots of smiles. These are great, they stand up to teens, wash up great (and frequently.) I don't think I could get hair nets in the kitchen so these are empowering and doable! Thanks for making them available. Good habits start at home! Nice adjustable fabric chef hat! It can adjust from very small to a much larger head. It washes well and still looks new after a year. These hats are EXCELLENT quality!! I purchased them for kids to wear at a baker-themed birthday party. The velco strip allows these hats to be adjusted for heads of ALL sizes. They are wonderful and clean up beautifully. 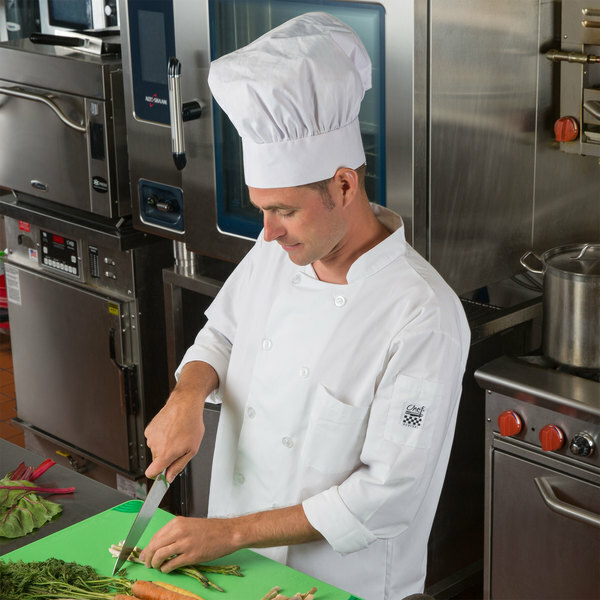 Chef’s uniform involves of many parts such as chef pants, jacket, apron, chef hat and chef neckerchiefs. All these parts of a chef uniform have their own purposes to play. Nice hat, great price. adjusts to many sizes. Great look too. good cloth, the stitching is excellent. It stands up nice, or lays down if you prefer. Super good deal.. 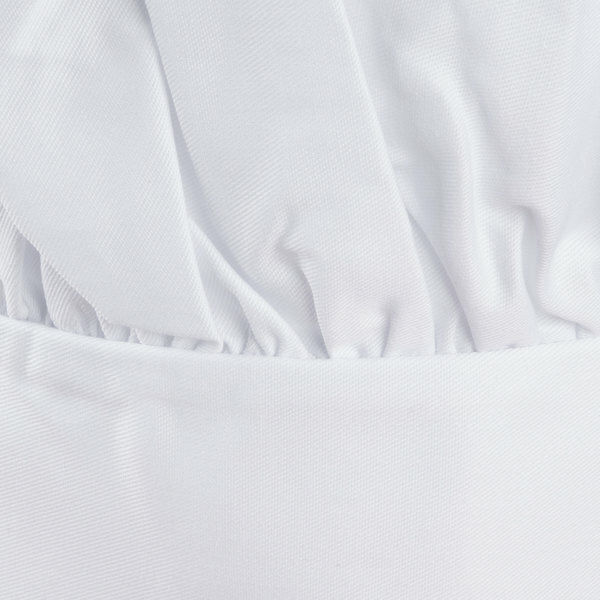 This classic white chef hat stands is large in size and provides the classic chef hat style with food prep sanitation. I will continue to use these in my kitchen. Wow what a great quality hat! The Velcro closure on the back is solid, and the hats look great on my students. They clean well in the washing machine with no hassle. I love this hat! It makes me look so professional in my restaurant and people love to comment them on my fellow chefs and I. Sometimes, I give them out for free because they are so cheap! This hat made a big hit with everyone at our Wednseday night dinner the first night that I wore it. Now, if I don't have it on, they ask where it is. Per the health department, we have to wear hats in the kitchen, so we purchased this. It's a little too tall, but it gets the job done and looks professional. These hats are great to have for events! The public loves seeing cooks in these hats! Great to wear for carving stations on a buffet!! This chef hat is great to keep hair out of food. The last thing a person wants to find in their food is a long strand of hair. Yuck! Love these hats for the price make you look and feel very professional and they are affordable too what more could you ask for? These are so inexpensive that I recommend getting 2 for every cook you have. Give them to the cooks and make them responsible for them. It will save you a lot of headache. The White Chef Hat adds that nice touch to our kitchen staff. It makes them look taller and with that, they feel even better about doing a good job. We use these hats for special occasions. They look terrific, and hold up well. Adds that little extra flair that youre looking for. Clean up perfectly, and are extremely comfortable. 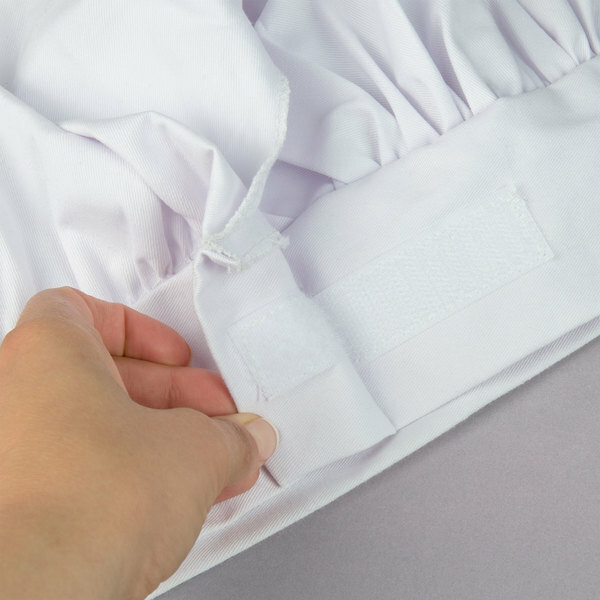 They are made to last and fit any size with velcro.They make my kitchen people happy and keep getting praise from customers as we look more professional as well as sanitation. We're not professional chefs, so we bought this just for fun. That said, it's exceptional. It sits well on my noggin, is nicely starched, and looks great ! What a value ! These chef hats are good quality, especially for the price. The ladies who work in our cafeteria really have fun wearing these hats on occasion.